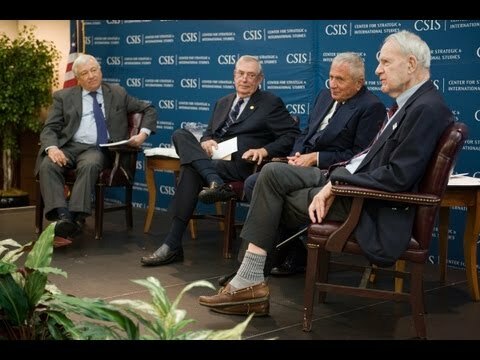 October 19, 2011: On the 38th anniversary of America’s first energy crisis caused by the 1973 OPEC Oil Embargo, three Nixon administration officials who formulated and executed the thirty-seventh President’s energy policy convened at the Center for Strategic and International Studies (CSIS) in Washington, D.C. The participants included Ambassador Richard Fairbanks, who served as Domestic Council Associate Director for Natural Resources, Energy, and the Environment; James J. Tozzi, former Chief of Environment at the Office of Management and Budget; and James R. Schlesinger, Chairman of the Atomic Energy Agency, Director of Central Intelligence, and Secretary of Defense to President Nixon, and the first-ever Secretary of Energy, serving under President Carter. Guy F. Cauruso, CSIS’s resident energy expert, moderated the program. Their discussion focused on how the President had to immediately create a framework to help stabilize prices domestically, while simultaneously assuaging the oil producing countries to end their embargo and continue exporting to the United States.